Happy Fall Y'all!! I love this season of color! Create a fun and colorful hand-stamped card with this unique baby wipe technique. 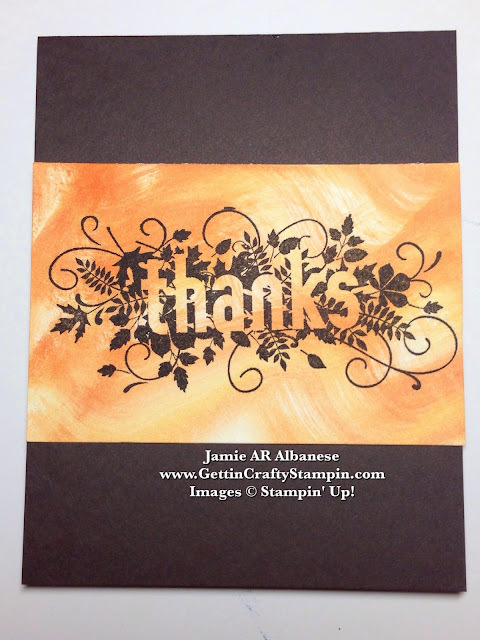 Send a warm and wow hand-crafted card so show your gratitude with this Thanks rubber stamped card. See this video tutorial and create your own cool background/paper. I love the colors of Fall! Sending a colorful hand-crafted card is a great way to deliver some of the season to those you love and appreciate. Saying 'Thanks' ,in a Thank You Card, is sometimes forgotten with the hectic lives we live. It means so much and goes to show that you care. I have to make an effort to stop and write a card but it's a blessing to see how it passes on my love and appreciation. 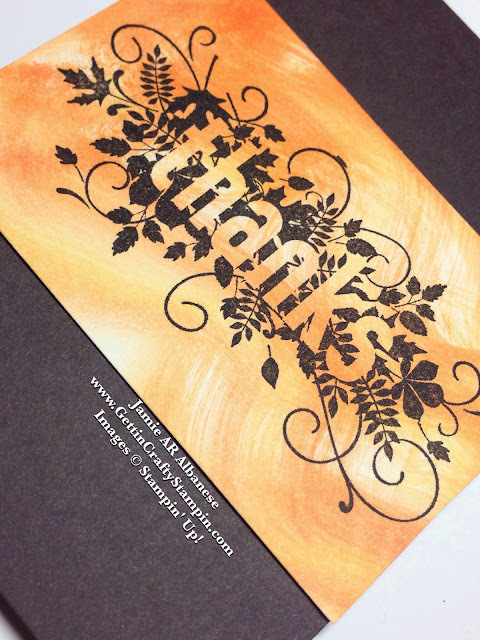 This warm, hand-stamped card is a great way to set the mood and show your gratitude. Much like music, food and flowers - setting the mood can be a gift in addition to the sentiment. Using the Pumpkin Pie and Daffodil Delight Ink Refills (ReInkers) and a baby wipe you can create a custom and WOW background for this quick and beautiful hand-crafted card. Once the background is set (and dried - give it a few moments) stamp the 'Thanks' in Early Espresso ink on the colorful piece for a delightful card. This stamp set is such a PRETTY Set with one word that says so much it's surrounded in a way that will embrace the season. Using SNAIL adhesive to adhere the tie-dyed and stamped piece to the Early Espresso cardstock base. On Technique Thursday's it's fun to highlight how a technique can be easy and take your projects to the next level! Create and send a hand-crafted card that says 'thanks' and shows how they've warmed your heart. This quick but WOW technique is a great way to do that. With a warm and colorful custom background you can stand out from the crowd and bless those who've blessed you. A hand-stamped card is a hug in the mail - so deliver some love and show that you care. Thank YOU for your love, support and encouragement. My family and business are so blessed by your support. Happy Thanksgiving. Blessings to you and your loved ones.